Providing you with beautiful looking hair for your important day. When you are all perfectly made up and in your beautiful dress, all eyes will on you when you are walking down the aisle. Here at Tonic Hairdressing, we are proud to offer our bespoke wedding hairdressing service which will provide you with your exact hair style vision for your big day. If you are looking for a that permanent straight and silky hair look with a blow dry or a fresh new re-style and change of colour, then we can provide just that and more. Our team of friendly stylists will make you feel relaxed and at ease when we begin the preparations for your special day. For that all important picture-perfect look, we also offer a make-up application services to ensure you look and feel amazing for your wedding. At Tonic Hairdressing, we are more than happy to offer a wide variety of bridal services, ensuring you are ready for your big day. We know how important your big day is and how important it is to get the right look, which is why we specialise in giving you and your bridal party a look that is flawless. Capable of creating a varied range of hair styles, you and your bridal party can rest assured in our knowledge that we will happily care and cater for all hair without any hassle or problems. 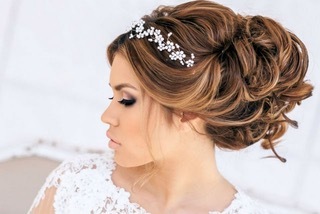 For stunning bridal hair on your big day, get in touch with the professionals for all enquiries on 028 9062 5560.